More than a hundred people attended the event at Rooty Hill RSL and more than a thousand tuned into the Facebook live stream. 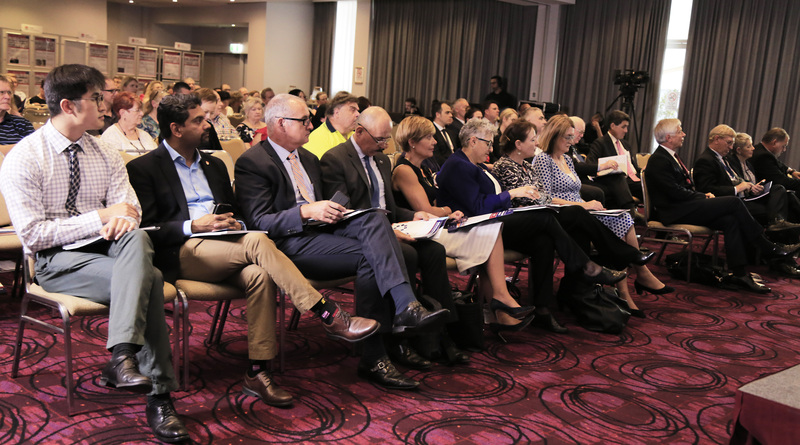 Record numbers took part in Western Sydney Local Health District’s (WSLHD) Western Sydney Health Forum and Annual Public Meeting last night. More than a hundred people attended in person at the Rooty Hill RSL and just over 1,000 people checked into the event’s first-ever live stream on the District’s Facebook page. The event opened with traditional songs performed by Caroline Norman, Indigenous singer from the Darug Nation, joined by her one-year-old son, and an official Welcome to Country by Uncle Greg Simms. WSLHD board chair Richard Alcock and acting chief executive Graeme Loy then updated the community on all the highlights from the year that was, thanked staff for their hard work and outlined the district’s health challenges and plans for the future. Acting chief executive Graeme Loy delivers his address at the 2018 Western Sydney Health Forum. A/chief executive Graeme Loy officially launched the WSLHD Health Services Plan to 2026, which is a blueprint for delivering healthcare to the community of Western Sydney over the next eight years. “Western Sydney is the fastest growing region in the state and we need to adapt to meet the healthcare demand,” he said. “Our community has diverse healthcare needs and we have identified six priority groups with significant health needs including children, older people, Aboriginal people, those from diverse cultural groups, people with mental illness, and people with chronic and complex conditions. “While we continue to expand and redevelop our hospitals and facilities, we are also partnering with general practitioners to enable more individualised care to be provided by healthcare services the home and in the community,” he said. WSLHD APM event Rooty Hill RSL. General view of the event. Seasoned journalist and NewsLocal publisher John McGourty chaired a question and answer (Q&A) session, where both live and virtual audiences were able to ask questions about issues that mattered to them. Mr McGourty praised Western Sydney Local Health District’s (WSLHD) willingness to treat community members as its valued partners and encouraged the community to provide feedback. “The forum places WSLHD as a leader in community transparency and inclusiveness. “WSLHD is a very modern health district that wants to make sure it is meeting the expectations of people in the area,” McGourty said. Our expert panel responded to questions from online and the audience. Left to right: Chief medical information officer A/Prof Naren Gunja, Blacktown Hospital general manager Sue-Anne Redmond, A/chief executive Graeme Loy, NewsLocal publisher John McGourty, WSLHD mental health services executive director A/Prof Beth Kotze, WSLHD integrated and community health services director Victoria Nesire and junior medical officer Jeremy Mo. “Being able to play a role in this public forum, using feedback, ensures people in western Sydney are listened to,” he said. To view WSLHD’s Health Services Plan, click or tap here. The District’s Year in Review was also released at the event. To watch footage from the live stream, visit the WSLHD’s Facebook page.